Strengthening, rejuvenating and unifying. Spikenard essential oil helps to rejuvenate dull, dry, and mature skin, and is used to prevent the premature ageing of skin. It calms and soothes red, itchy, problem skin conditions, encourages hair growth, and also combats dandruff. Combine spikenard with tea tree oil for best results when treating dandruff. Known in Ayurvedic medicine as Jatamansi oil, Spikenard is an effective essential oil to relax states of agitation and to help regulate the nervous system. In common with frankincense and myrrh, spikenard essential oil promotes a state of peace and tranquillity and helps to soothe a troubled heart. 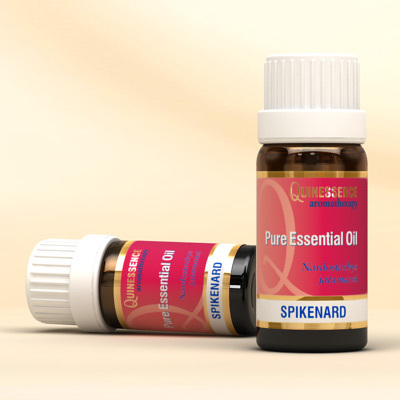 Spikenard Essential Oil has a complex green-mossy, slightly woody and earthy aroma with musky overtones, and also has nuances that are reminiscent of valerian oil (Valeriana officinalis). Hardly surprising, since it is a close relative of this species. Despite their botanical relationship, spikenard does possess therapeutic qualities that are different and its aroma is much more appealing than valerian. Spikenard oil is commonly used by women in India to perfume their hair. Spikenard was known in biblical times as Nard and was used in incense during religious ceremonies. The oil extracted from the root of the plant was considered holy and believed to instill inner peace and nourish the soul. It was also used as a medicine.